I have been blogging about learning resources for a while and one of the best ways to learn from the experts is to attend in person conferences! SPTechCon gave me a 4-Day All-Access Conference Pass to SPTechCon Austin 2016 to give away to the readers of my blog! To enter you simply have to put your name and email, and you can get bonus entries if you follow @vladcatrinescu on Twitter and like the Absolute SharePoint page on Facebook! Furthermore you can tweet about the giveaway every day and get 9 bonus entries for every time you tweet! 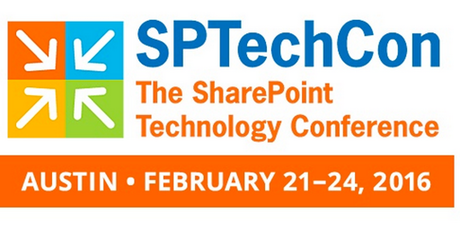 SPTechCon: The SharePoint Technology Conference is returning to Austin, Texas! SPTechCon will take place February 21-24, 2016, with more than 80 technical classes and tutorials presented to help those utilizing SharePoint technology and maximize their effectiveness with it.